This value offering from Samsung will appeal to the masses for several reasons. 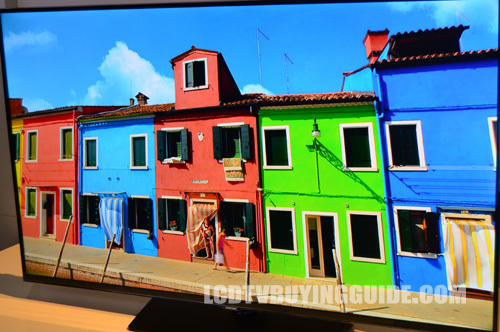 First, Samsung is offering it for very low prices for a 1080p Smart TV. 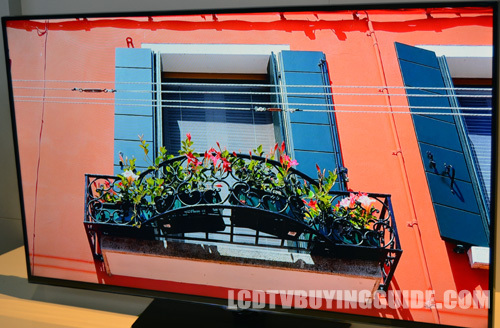 You'll get all the best in Samsung's Internet TV options with much better organization and layout than previous years. There are some drawbacks such as a very basic table top stand that looks somewhat dated, and only 2 HDMI inputs. 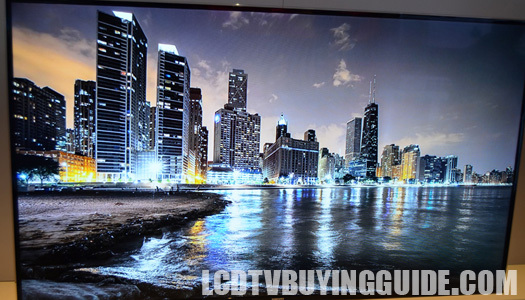 The picture on the UN50H6203 is characteristic of LED TVs in years past with a couple of exceptions. The bright backlight is an obvious plus and calibration efforts are necessary to develop a natural looking picture. Balancing reductions in brightness/backlight/contrast level with maintaining adequate coloration is tricky. The LCD panel is of the semi-matte finish screen and not of the highest quality with such features as light absorption. As a result, there is poorer side viewing angle quality and depth perception in this TV as all matte type LCD screen finishes diminish contrast and saturation at side viewing angles. While this treatment does cut down on top surface reflection from the screen, there is glare off the screen from in room light. That glare from in-room lighting can get annoying at times and is something that owners will constantly be aware of. As a result you will likely want to keep the backlight tuned toward the upper end of the control spectrum to help eliminate the glare. The H6203 does have a 120Hz native panel (clear motion manipulated 240) which really helps with fast motion judder. The black bars top and bottom 16:9 content look very saturated, which helps colors pop. There is some blooming around the edges and corners of the screen with dark content when accessing apps or programs but it's not very visible when actually displaying content. Light flow-through can be very good on this TV – especially with HD content. As mentioned above, this is one of the major drawbacks of the TV. Though the options are strong, the slow loading of Apps pretty much negates the benefit. You may also run into a few hitches when accessing the Apps initially during set up like we did. But after working it out, the negative we noticed was slow response times when loading and returning to Apps due to a limited memory. It can be a bit frustrating. The inbuilt web browser is there if you must access the Internet, but it's not likely something that will add much value as you likely will not use it much due to the slow nature of the 5-way controller search. Loading time from the open internet was pretty fast. Of course with the H6203 you will sacrifice a bit in the looks department, but not too much. The thin matte black bezel is fairly unobtrusive and while not frame less is still less than an inch wide. The stand is probably the biggest drawback. It's pretty basic looking and dated to older designs with a black plastic base. The 65” version is 3.8” in depth so not super slim, but that extra room allows some depth for speakers. While the 10WX2 designed speaker quality is on the low end of TVs, it's not completely bloodless. There is a nice feature in the H6203 called Smart Sound which regulates sound output to a constant level, thus negating the louder effects of annoying ads. One drawback to supporting a sound bar for the TV is that it does not the HDMI inputs do not have audio return channel capability to return the sound to the sound bar. So using a sound bar or surround sound receiver will not be as seemless with the picture on screen when attempting to upgrade the sound quality. This is of course more important on the larger sized offerings of the H6203. Price is an important consideration for the UN50H6203, probably the main consideration at only $729 for a 50” LED screen. The Picture Quality is good, especially with HD content. There are drawbacks to the Smart TV delivery. Competition is from price-oriented models like the Vizio E-series E500i-B1. Dimensions without stand (W X H X D): 44.8" x 26.5" x 3.7"
Dimensions with stand: 44.8" x 28.5" x 9"
Weight without stand: 34.4 lb. Weight with stand: 40.1 lb.